Only eleven miles from midtown Manhattan lays a 154-acre brownfield site that takes up nearly a third of the land area of densely-populated Wood-Ridge Borough, in Bergen County. Largely abandoned since the early 1980s, the site includes a two-million square foot World War II airplane factory where the Curtiss-Wright Corporation manufactured engines for B-29 bombers. At its peak during World War II, the complex employed more than 15,000 people. Eighty of those unused acres are being used to create the Wesmont Station development project that is transforming the last remaining developable brownfield site in Bergen County into a model of transit-friendly development. The site is being cleaned thanks to a $1 million loan from the State to clean up the site’s traces of petroleum and chemical products that were once stored there. The development, which had its ground breaking ceremony this past February, will include 737 residential units, 130,000 square feet of retail, a wide variety of housing, a public square, community center, a new middle school, walking and biking paths, and office and retail facilities all within a five-minute walk of a new planned train station that will connect with the Bergen Line commuter rail to Manhattan. The project is being built where there are already-existing water and sewer lines, several public schools, numerous bus routes, and Route 17. The housing at Wesmont Station will consist of 217 single-family homes, 135 rental apartments, 131 condos, 77 condo apartment units for people age 55 and older, 166 town houses, and 11 live-work spaces for artists and small entrepreneurs. 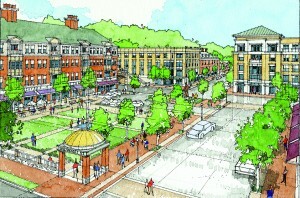 The train station and plaza will be the centerpiece of the development. Every home and building will be within walking distance of it. Pedestrian bridges, light fixtures, planters, benches, bike racks and extra-wide sidewalks will help to define Wesmont Station as a pedestrian-oriented community. Children who attend the planned middle school will be able to “commute” without ever entering a roadway. Streets will be narrower than usual to create a “traffic-calming” effect, he said. Parking lots for commuters will be kept to less than two acres in size. Conceived by the Mayor and Council of the Borough of Wood-Ridge and its local stakeholders, Somerset Development and renowned town planners Duany, Plater-Zyberk & Company and DMR Consulting Group, the project partners reached out to the entire community for design input. Hundreds of local residents participated in the design charrette sessions, which led to the creation of guidelines about the design of signs, the mass of buildings, the look of exterior light fixtures, roof pitches, windows and doors, siding materials and colors, porches, decks, and ornamental trim. The site’s rich history will not be lost. The two-million-square-foot former factory building that dominates the site will remain as the new neighborhood rises on the hill above it. Heavy manufacturing ceased there more than 20 years ago, but Somerset Development has managed to fully lease the space for warehouse and office use. Free-standing tall, narrow concrete towers where B-29 engines were hung up and run continuously for 48 hours to test them will be incorporated into the school buildings. Several old bomber engines will be put on display in an aircraft museum at the site. The public square will pay homage to the site’s industrial past with a prominently displayed bronze sculpture of “Rosie the Riveter,” the emblematic symbol of women who did factory work during World War II, to commemorate the 6,000 Rosies who worked at the Curtiss-Wright plant.